Official logo of the Snellman jubilee year. Johan Vilhelm Snellman was born on May 12, 1806 in Stockholm, Sweden, where his father was a sea captain. 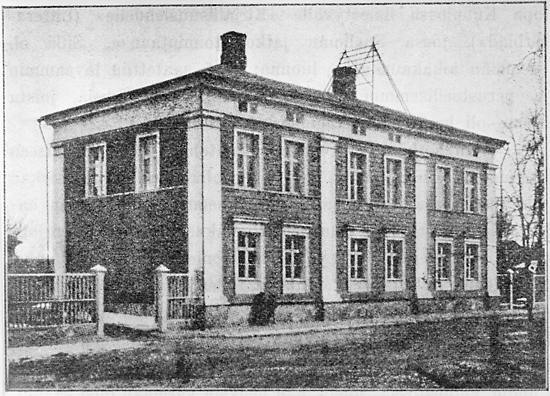 After the Russian takeover of Finland in 1808 and 1809, and the establishment of the autonomous Grand Duchy of Finland, his family moved to the Finnish coastal town of Kokkola in 1813. When Snellman’s mother passed away only one year later, he was sent to school in Oulu, northern Finland, where his aunt lived. Snellman matriculated from school at the age of 16. 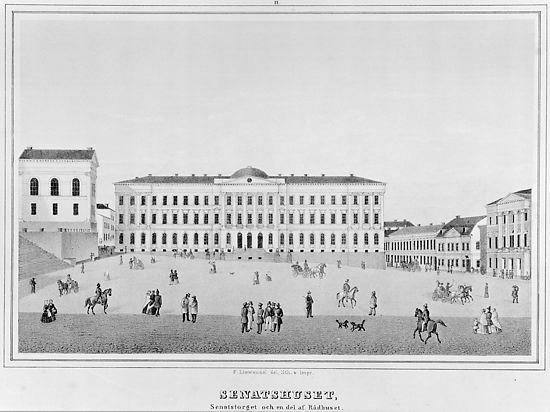 He then studied at the Academy of Turku – which was relocated to Helsinki in 1828 and became the Imperial University – and gained his Bachelor’s degree in 1831. 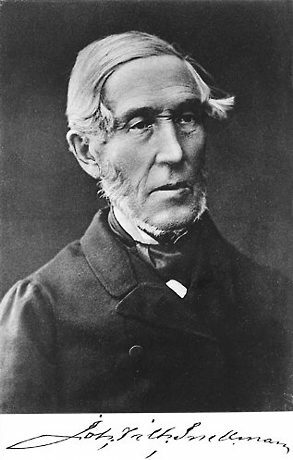 During his studies, Snellman became friends with Elias Lönnrot and Johan Ludvig Runeberg, both of whom would have significant impact on his future endeavours. After finishing his doctoral thesis on Hegel, Snellman was appointed to the post of lecturer at the Imperial University in 1835. As an ardent opponent of Russian rule over Finland, he refused to take orders from the Russian-influenced university directorate on what and how to teach. Eventually, despite being highly popular among students, Snellman was temporarily suspended, in 1838, after a judicial action aimed at increasing the government’s control over dissent among academic personnel. Until the nineteenth century, however, there had been almost nothing published in Finnish apart from religious works. This void was eventually filled by Kalevala, the Finnish folk epic and single most important work of Finnish literature. The book was compiled by Snellman’s friend Lönnrot. Another important publication was The Tales of Ensign Stål, a collection of poems authored by Runeberg. 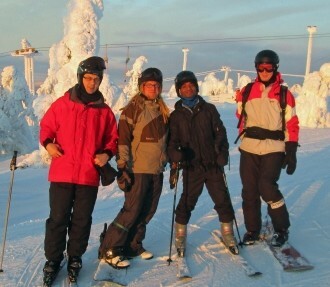 The first poem of the cycle, entitled Our Land, was soon set to music, and later became the national anthem of Finland. 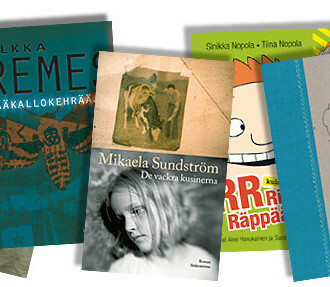 From Kuopio, Snellman begun to publish two periodicals. 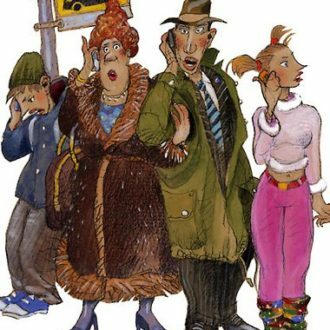 Maamiehen ystävä (English: ‘The Countryman’s Friend’), the only newspaper published in Finnish at that time, was aimed at ordinary Finnish folk to strengthen their national identity and enhance their language skills. Saima, written in Swedish, emphasized the duty of the educated classes to take up Finnish, spoken by 80 per cent of the population at that time, and develop it into a language that could be used in academic work, fine arts, statecraft, and nation-building. In 1856, Snellman was, to the great satisfaction of politically interested Finns, finally appointed professor. Seven years later, he was nominated for a cabinet post in the Senate of Finland, in effect as the Minister for Finance. As a senator, Snellman was able to pass a language decree, which gradually gave Finnish a position equal to that of Swedish within the Finnish government, and thus effectively in the entire country. Moreover, Finland’s own currency, the markka, was introduced in 1865 mainly as a result of Snellman’s efforts. However, Snellman, now a man of the government, was not able to retain his unparalleled popularity among all Finns. His uncompromising stand on the language issue also contributed to considerable opposition against him. Ultimately, Snellman’s inflexibility and position in the political debate, together with his old reputation as a radical agitator, accumulated too much resistance and antagonism against his person and policies. He was forced to resign from the senate in 1868. Despite his setbacks Snellman continued to participate in political debate for the remainder of his life. He was made a nobleman in 1866 and thus acquired a seat in the Nobles’ Chamber in Parliament. Even though Snellman never lost his popularity among his pro-Finnish adherents, he had developed into a highly divisive figure in Finland’s political landscape. Snellman died in July 1881. His statue stands in front of the Bank of Finland and his picture has appeared on Finnish banknotes. Given his colossal significance in Finnish nation-building, Johan Vilhelm Snellman is regarded by some as the greatest statesman in the country’s history.